For more information, please visit the Kymco website. Liquid cooled V-Twin engine, alloy wheels, chrome detailing, low stance, flowing lines, and large disk brakes - does it sounds like we're describing a large c.c. cruiser? The Venox 250 (yes, 250) boasts all of these qualities and more. This classically styled cruiser weighs only 190 kg and has been designed exclusively for beginner riders. It has a mature look that's got all motorcycle enthusiasts coming back for a closer look. With top speeds of 130km/hr and a 14 litre fuel tank, the Venox can take you anywhere you want to go, in style! EPA certified, very fuel efficient, and of the highest quality, this gorgeous bike has much more to offer than just its good looks. The sound is great, the ride is smooth, and the price is unbeatable! 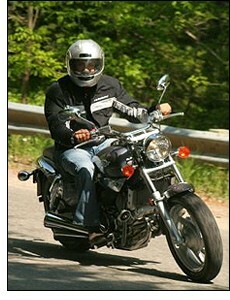 Whether you're a beginner or a seasoned rider, the Venox 250 has something to offer everyone.